Miss Ellen Stockwell was one of our own, the smartest kid who ever went through Deerborn Elementary School, my father used to tell me. Those days we had only an elementary school and when Ellen graduated from high school the next town over, people weren’t surprised that she disappeared. She left permanently, they thought, to work and study with “foreign intellectu’ls.” But roots run deep in New Hampshire’s north country, and a few years later, Ellen returned from a rumored apprenticeship at the Pavlov Institute. She appeared one day at the bus station, suitcase in one hand, a small girl-child in the other. No one knew where the girl-child came from, but she had the curliest, reddest hair this side of Concord. Even Ellen’s widowed father must not have known, for he alone among the Stockwells had been a talking man. People speculated about an abandoned lover or a patient at the Pavlov Institute who had fathered the child before he lapsed into permanent schizophrenia. Deerborn is not a prying town, so no one asked even a year later, when the child and Ellen’s father both died of the same unexplained malady of the nervous system. Ellen was left, the only surviving Stockwell, the owner of a steadily declining house on Stockwell Hill just down from the elementary school. She became Miss Ellen, hired to teach alongside the aging Miss Jansen, who may have frowned upon the young teacher’s newfangled ideas, but hadn’t energy to protest. We were eleven children in Miss Ellen’s class, the beginning of a rising generation of war babies. Stacey Grant, an undersized first grader, sat next to me all that overwhelming fall when I was learning that school meant more than reading and writing. Stacey never appeared for recess. She stayed inside for what Miss Ellen called special help and what we thought connected somehow to her motherless childhood. Joe Grant never allowed his only child, born of a protracted labor that killed her mother, to mix with the other children. I would study her frail body, her drifting eyes, her mouth that would go slack when she wasn’t mumbling. But she remained for me as much an enigma as Miss Ellen. What Miss Ellen would do with her during recess time we never knew, and when the school board called all of us in to “explain about Miss Ellen and Stacey Grant,” we had nothing to tell except that if she started to moan in class, Miss Ellen would ring a little bell and the moaning would stop. She never called on Stacey or put her in a reading group or had her do the morning jumping jacks. But she didn’t ignore her either. Every time we’d change from arithmetic to reading or reading to art projects, she’d first attend to Stacey. She’d give her a piece of paper and a crayon or the beaded abacus or any of her drawerful of assorted and mysterious objects that looked like two-piece puzzles. Stacey could never fit the pieces together any more than she could draw with the crayons or make sense of the abacus. Perhaps the first thing we learned, the thing I most remember, was Miss Ellen kneeling next to Stacey’s desk, her soft blond hair even with Stacey’s red braids, her thin, pale hands placing a crayon or puzzle or the abacus into Stacey’s uncontrolled grasp. Then she would ring her little bell, rise, begin our lesson in a voice too strong for her thin body, and Stacey would stay quiet. Until one day after we’d faced the school board, Stacey was gone. Miss Ellen remained just a month longer, a month I remember as filled with oddities and the ever-present bell. Every morning she would take out paper and pencil and books and give us some vague sort of instructions. As soon as recess came, she would ask me to be Pavlov’s puppy, a term she uttered with hushed wonder. She would take me into the closet, sit me on her lap, and stroke the ponytail that tried to tame my thick red hair. Then she would read from a great book of fairy tales that lived the rest of the day on a shelf in back of the schoolroom. When she finished a story, she would take me off her lap and stand me in front of her. She would ask me to retell the story. If I summarized poorly, she would turn out the light. If I recited well, she would ring the bell and give me a piece of candy out of a tin with a picture of a fruit on the lid. Over and over for what must have been a month, Miss Ellen led me through the game, the times I performed well lengthening each day. I remember it not as unpleasant but as confusing and very tiring and as a ravenous hunger for the little pieces of candy. For years, I dreamed about fairy tales, but their contents would fade when I woke up, leaving a longing I can only describe as an emptiness like the one I feel when there’s a holiday and I have no place to go. On the last day, the police came and I was pulled from the closet before recess ended. Miss Ellen never returned to the school, almost never emerged from her house, and never called on anyone to keep that house in any kind of repair. Gradually she became known as the town eccentric, the woman children were afraid of, the one adults left to her peace. The one I could not forget. I have lived alone for years now, in a neat, tiny house next to Miss Ellen’s on Stockwell Hill. I have watched the children quicken their pace and hunch their shoulders as they rush past her house. It isn’t one of the oldest houses in Deerborn, but, built before 1900, it should have been respectably old. Instead, it stands like a cancer next to the sidewalk, its paint chipping, its shutters askew, its half-drawn shades obscuring the darkness within. No window is ever battened down to keep out the January winds or opened on the hottest dog days of summer. No one sweeps the cluttered porch that covers a full side of the house. In summer, the house smells vaguely of the skunk that lives somewhere in the overgrown yard. Even in January, the porch smells of dampness and rot, not the rancid smell of decaying garbage, but the musty smell of wet newspapers and cardboard boxes. I began to notice a change in January that soon became obvious to others. Old rumors surfaced from sixty years of silence. Though she was in her nineties, Miss Ellen could still walk the quarter-mile to the village where she bought her boxes and bags of dried food and begged a jug of water and a day-old newspaper. Before the children were freed from school, she would be back in that house, cocooned beneath a nest of blankets and newspapers—we never believed she read those day-old papers—in the lone back room that sometimes was lighted by an oil lamp. It was this burning lamp that first signaled the change. From my bedroom window, I could see it lighting up the back room until after ten o’clock, though it was the coldest time of the year so that in her heatless house Miss Ellen should long ago have nested down. January was the month when ordinarily the lamp burned least often, Miss Ellen’s nighttime hours increasing in direct proportion with the decreasing hours of sunlight. I often thought that only her south-facing window kept her from perishing during the cold winter. The first night I noticed the lamp, I thought Miss Ellen must have fallen asleep and I prepared to keep an all-night vigil for fear the house and its papers would ignite. But before midnight the lamp stopped burning and I went to bed more puzzled than relieved. The next night, the lamp burned again. By the third night, I knew that Miss Ellen was not falling asleep, and by the end of the week, the rumors had begun. Each day when Miss Ellen begged water for her plumbingless house, she bought a little tin of French hard candies made without artificial color, a fruit design on each lid signaling the flavor within. Along with the fruited candies, we began to see Vera talking to her. Vera was the daughter of a middle-aged widower, who had long ago lost all control of her. The villagers kept one wary eye on her and with the other ignored which of the town toughs were hanging around her. Gradually, Vera began to appear every day at Miss Ellen’s. Each night, I heard the soft, high tinkle of a bell. As winter passed and the weather began to soften, Vera and Miss Ellen would emerge from the house together, Vera’s body seeming to fatten in direct proportion to how Miss Ellen’s dissolved. On the warmest days they would sit on the step of the porch while the sun was high. We began to joke about how with her red hair, Vera could have been a teenaged incarnation of Miss Ellen’s dead child. But eventually we ignored them, taking them out only once in awhile for a piece of local color to share with visitors. That spring the gypsy moths invaded, covering our trees and lawns and driveways in masses of brown caterpillars. At night we could hear them munching through the new greenery and in the morning we would sweep away their droppings, using cleanliness as a battle tactic. Except for Miss Ellen, whose house the caterpillars chose to cover, or perhaps whose house they retreated to when we swept them away from our own. 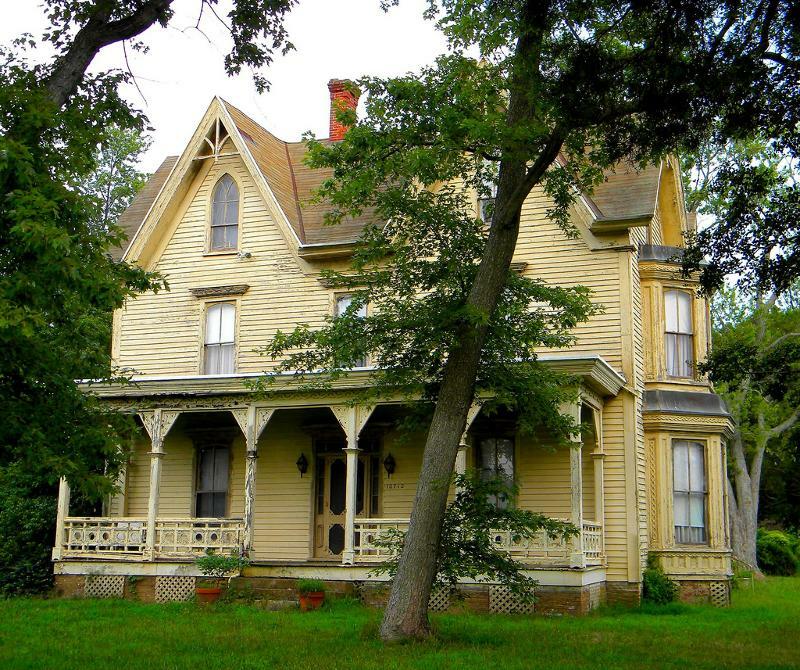 Soon they transformed the cracking, dirty white clapboards into brown undulations, a moving sea of infestation that seemed nourished more by the house’s decay than by the emerging leaves of the tree in front of it. They crept through the cracks in the front door and through torn plastic that covered the broken windows. We began to see them crawling along the insides of the shades and curtains. The porch was a breeding ground. Children were instructed to cross the street before they walked past Miss Ellen’s house. Parents called the school, which called the county health department, which assured us all that unless we let them crawl on us, gypsy moths were harmless and would naturally kill themselves off with their own gluttony. So we swept and we scrubbed, and shuddered when Miss Ellen walked through her porch without brushing a path for herself. Even Vera knew enough to push aside caterpillars. One day I watched her walk behind Miss Ellen delicately picking them off the back of a skirt I recognized as one I had put in the recycle box outside the village store. Toward the end of the infestation, when we could walk outside in the morning without sweeping away square gypsy moth droppings, Vera came from Miss Ellen’s house alone. She looked haggard, as spent as the dying gypsy moths. She spoke to no one and even her father didn’t know why she left town or where she had gone. After five days when Miss Ellen hadn’t appeared for her supply of groceries and newspapers, I called the police chief, who called the ambulance squad to follow him into the house. They parked on the edge of the sidewalk, lights flashing in anticipation of what we knew they would find. A Deerborn crowd gathered to watch as they climbed to the porch. I saw the skunk I had known must be living off Miss Ellen’s debris. It dove under what looked like an old hassock, its fur blending with the hassock’s spilling insides. The porch was covered with dead or dying caterpillars, a few that had managed to metamorphosize to the moth stage resting in a tight group on a plastic bag caught on the edge of a torn screen. I could smell death, like a pile of sweaty clothes thrown against a radiator and cooked, the body odor putrefying as the sweat dried. No one stopped me when I followed them inside. Miss Ellen must have been dead the whole week. She lay on top of a ragged blanket, curled in a fetal ball in a darkened corner. My skirt was tangled around her hips, revealing bare legs covered with the dried ooze of sores. Two hatched moths moved along her body, nibbling the fabric of her clothes. Trailing down her back was her blond hair, darkened with dirt and age. I saw the hair move, and move again, and again, alive with nesting caterpillars. A tiny baby lay in her arms, naked and red, its umbilical cord wrapped around its neck. I closed the diary, put it in my pocket, and reached for the book, the bell, and the tin of candy. I rarely go out now. I watch the changing seasons wrap themselves around the house on Stockwell Hill. I read the fairy tales I remember so well. I recite the stories. When I take a recess from my work, I ring the little bell and eat a piece of candy. This entry was posted in Issue 16:2 and tagged Fiction, Sharon L. Dean by TC Editors. Bookmark the permalink.